Filled with interviews, still photos, and live footage from the tour this adventure video tells the story of an epic around the world bicycle adventure. See and hear first hand what it was like to camp more than 1000 nights, chop through the dense Darien jungle, ride a bicycle through war-torn El Salvador and a South Africa still under the tyranny of Apartheid. 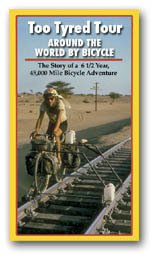 And learn what it took for three young adventure cyclists to stick together through thick and thin. A delight for all ages.